We had great weather and great birds for our "First Sunday of the Month." Among the highlights: Hundreds of egrets, a few Pectoral Sandpipers, an immature Little Blue Heronand several Black-crowned Night Herons. We did not see a Sora or the Least Bittern, but both were seen over the weekend. Topping off the day was a most-informative talk on salt marshes by Rutgers Professor Judith Weis, who covered such topics as new invasive species, climate change, Phrags vs. Spartina, and the Meadowlands' amazing environmental recovery. The talk was part of the Meadowlands Commission's 40th anniversary celebration. 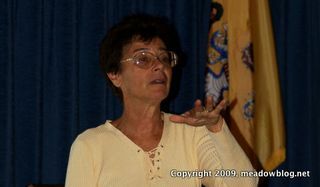 If you missed Professor Weis' talk, copies of her new book "Salt Marshes" are available at the Meadowlands Environment Center's Gift Shop. Our next walk is Tuesday, Oct. 20, at 10 a.m. at the Ridgefield Environment Center. 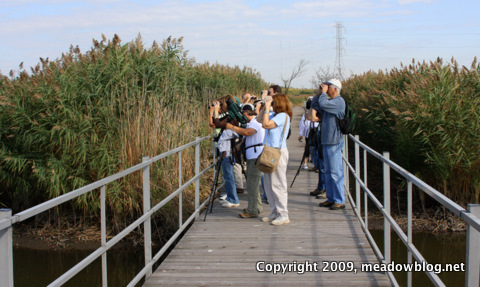 We'll also visit Ridgefield's amazing Monk Parakeets and the Skeetkil Marsh. More information in the coming days on this blog.